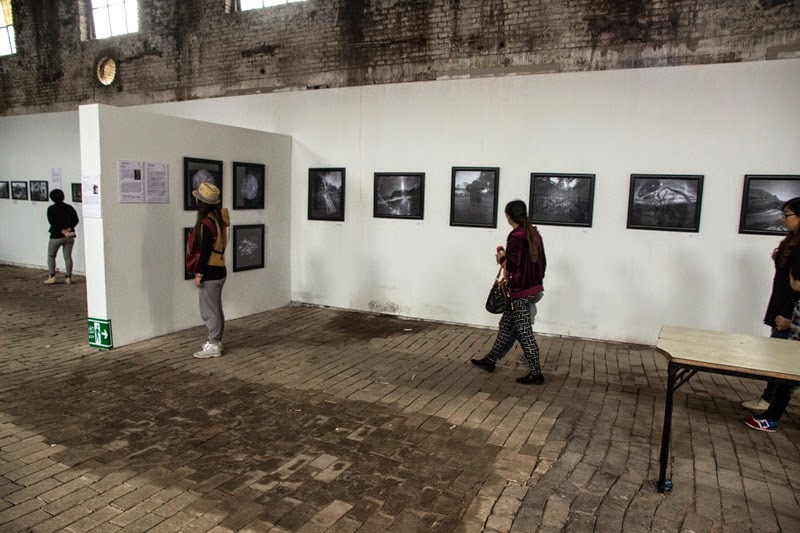 The New Zealand contribution to the 2014 Pingyao International Photography Festival included three exhibitions, six floor talks, a three-hour seminar, several television interviews, posing with Chinese strangers, and making new friends from all over the world. The vocabulary of PIP volunteer translators, who were mostly students of the dynamic Amy Liu of Taiyuan Technical University, was seriously tested with our odd Kiwi accents and vernacular speech. Julia Durkin, Director of the Auckland Festival of Photography, somehow found time from intense networking to join the portfolio review team, while I, as a guest curator, was free to network after helping "my" photographers, Craig Potton (Nelson), Ian Macdonald, (Auckland), and the environmental sculpture couple, Martin Hill and Philippa Jones (Wanaka), whom I had not met before, to settle in. They were joined by Jenny Tomlin, from Auckland, who had a solo exhibition. 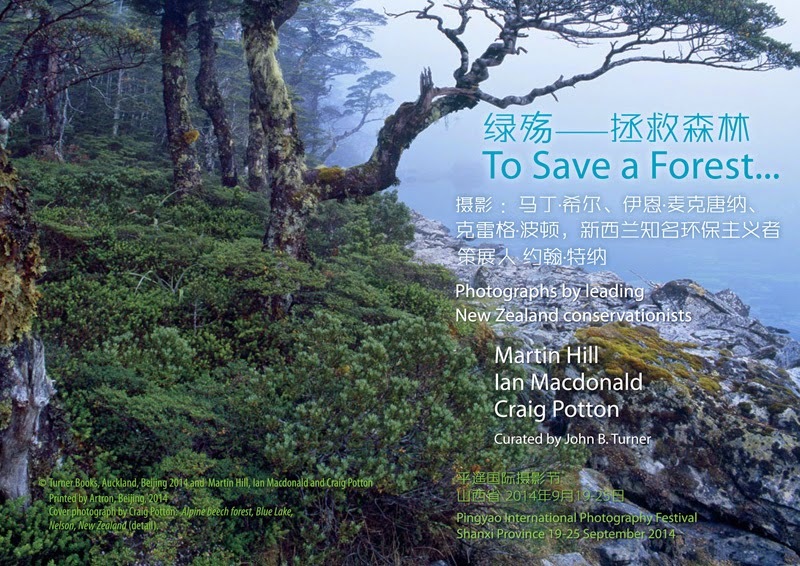 To cap the NZ presence, Martin Hill won an 'Excellent Photographer Award' and 4,000 people were given a free copy of the 32-page A6 bilingual catalogue of To Save a Forest... Photographs by leading New Zealand conservationists: Martin Hill, Ian Macdonald and Craig Potton. 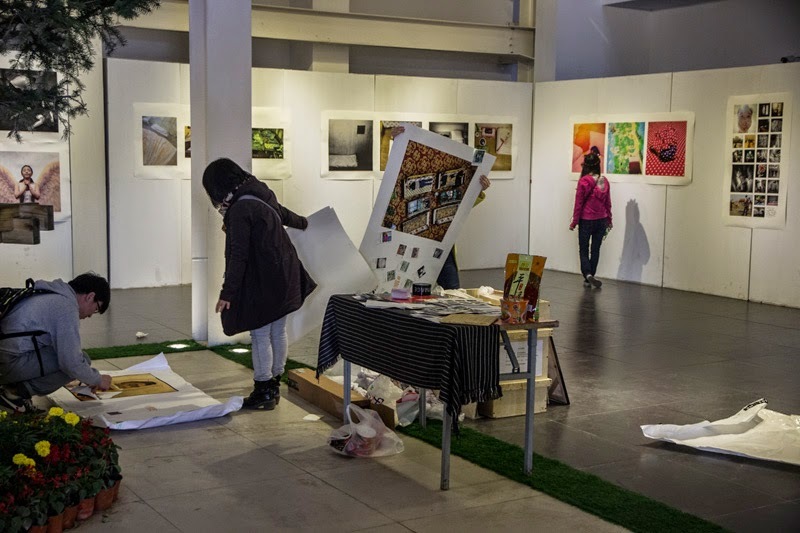 As usual, there were pluses and minuses to the PIP Festival, with the positives dominating, and apart from the extraordinary array of photographs on display, it was the genuine warmth of their welcome, and the generous help from the volunteers that made a huge impression. 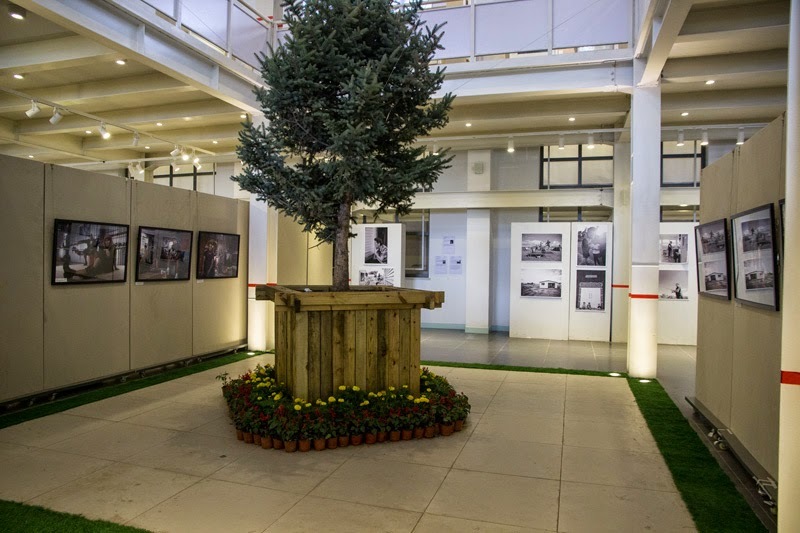 Ian Macdonald summed up the exhibitions when after his initial foray he returned to exclaim that he had seen more outstanding photographs in two hours at PIP than he had seen during his recent exploration of London's photography scene over a four week period. 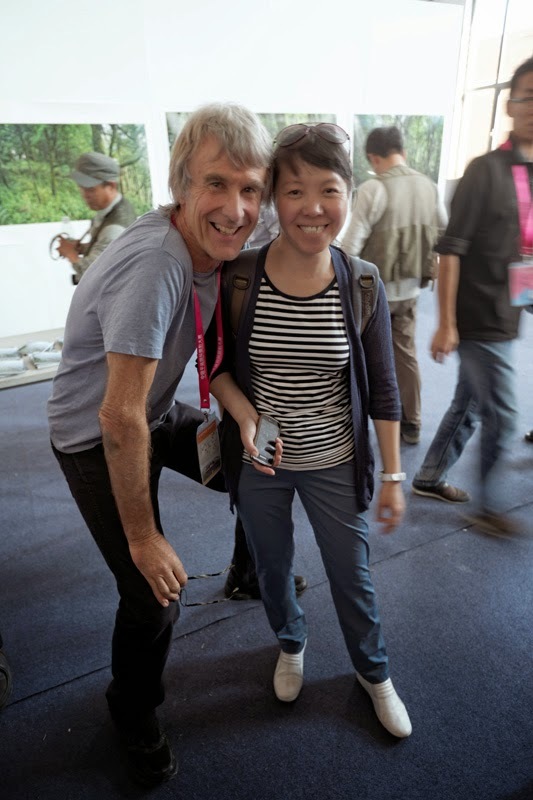 Ian and Elise Macdonald are legendary hosts, and Ian did as much as any official tourist bureau could to entice their new Chinese friends to get to enjoy a New Zealand visit and visit them at home in Matakana. I was also tormented by the fact that no extra lighting would be provided to brighten the shaded side of the panels for our 'To Save a Forest...' show. The effect was to compromise viewing of most of Craig Potton's work until late afternoon when the small floodlights unevenly illuminated his glowing prints and shaded Ian's and Martin's. That PIP suffers from serious underfunding is pretty obvious. 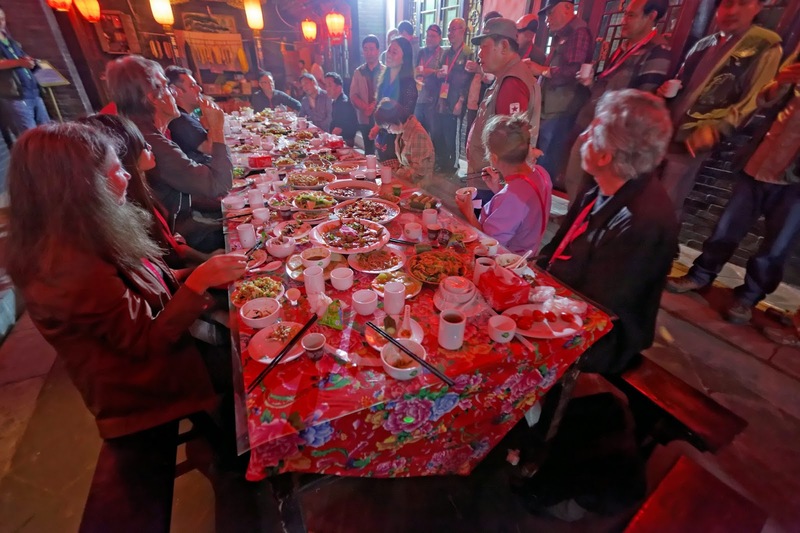 The Shanxi government's decision to make PIP more of a fair, with a new avenue of overhead lanterns lined with numerous small stalls offering tourist trinkets, demonstrates an inability to understand the uniqueness and the real needs of such a festival, with so much potential for increasing the number of informed foreign and Chinese visitors with a particular interest in photography. 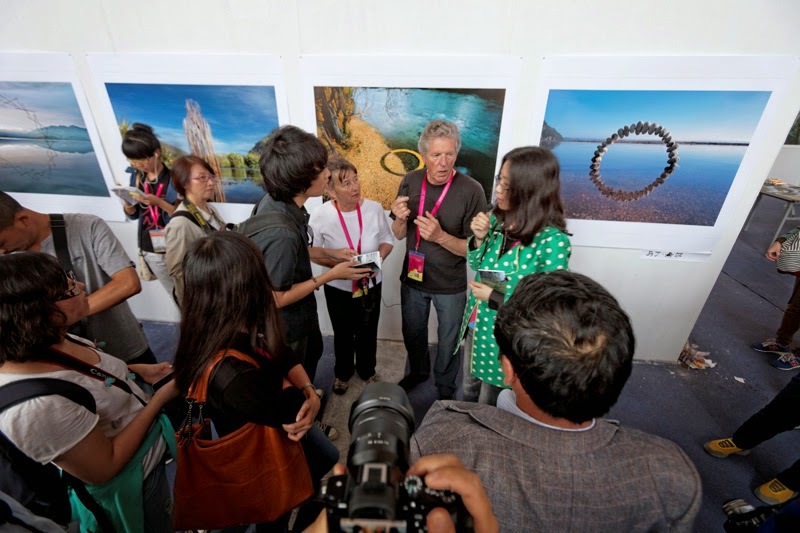 Equally, the razzle dazzle of the Awards event, designed exactly like a commercial television presentation, is another lost opportunity to seriously celebrate photographers and photography. Not least because when something went seriously wrong with the electronics this year, the small intended slide show of work on exhibition was not seen. Coming back to the issue of display lighting, it was, ironically, very noticeable in B7, how beautifully lit the delightful and impressive cellphone exhibition, 'My Bed & One Day in China' was. 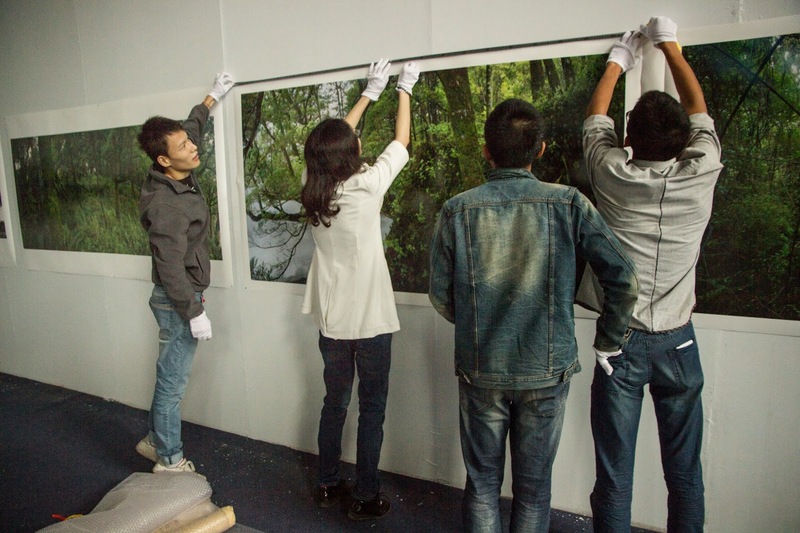 Subtitled 'The First China's Top Ten Mobile Phone Photographers' a kpkpw show curated by Fu Yongjun. When I asked why their lighting was superior the answer was that exhibitors could reposition the lights for their work. However that might be, the lighting system elsewhere, high in the ceiling, did not look that sufficient or flexible. 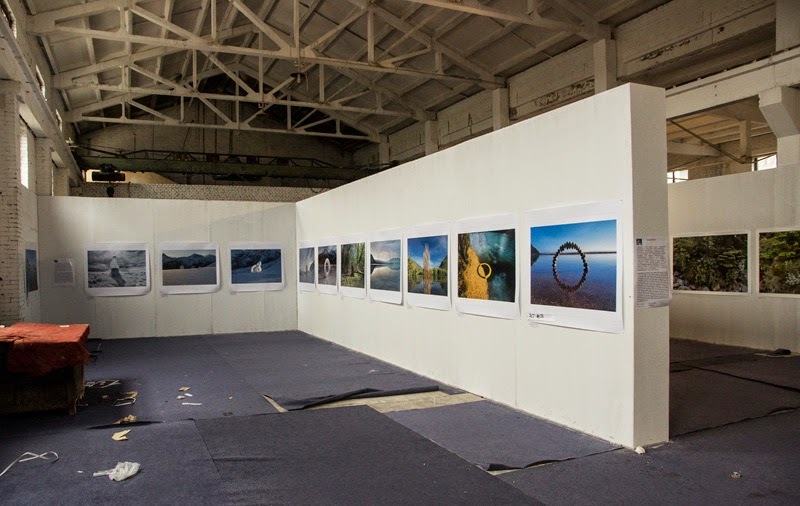 In last year's PIP blog I had expressed my hope that the Auckland Festival and any other contributions would present significant work from south of the Bombay hills, to better represent photography in New Zealand, so it was good to see Veling, Hill and Potton included in this year's offerings. 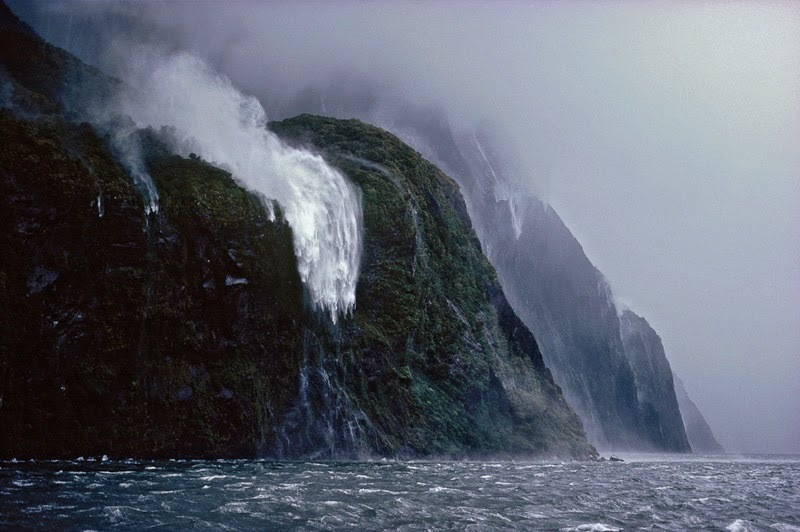 A three-hour seminar by Hill, Potton, and Macdonald was attended by over 70 people, mainly in the younger age group, with several expressing their hope of visiting and studying in New Zealand. 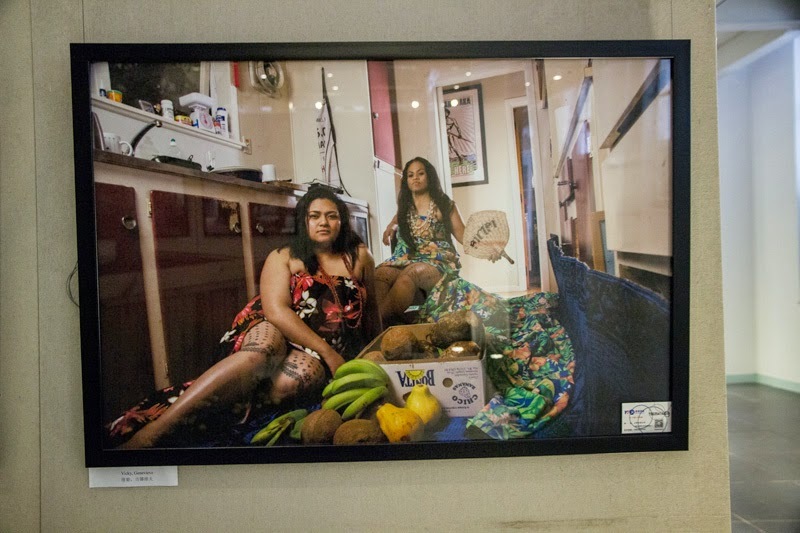 It is interesting, but by no means comforting, to see that some of the finest work featured at PIP is often displayed in the labyrinth of makeshift and often leaking spaces that PIP is renowned for. 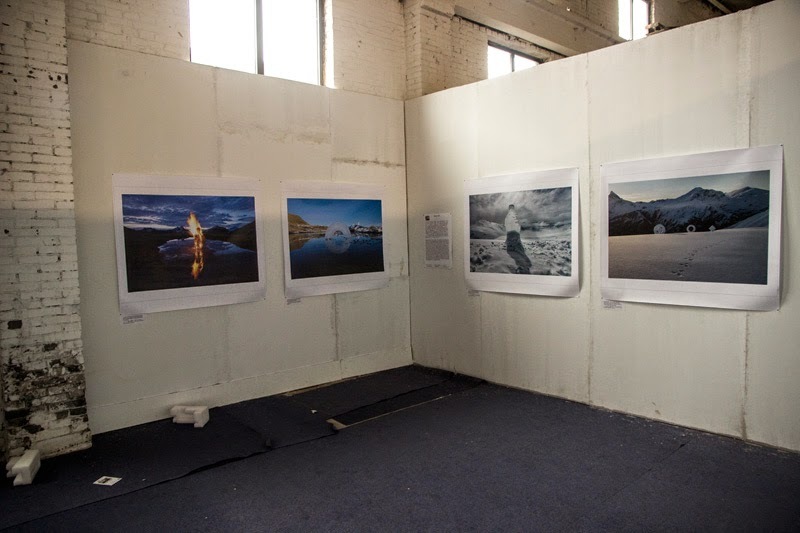 Thus Jenny Tomlin found her pinhole work displayed opposite that of Ed Kashi, the VII agency photographer, in equally dismal lighting in Diesel Factory A5, where my 'Tint' exhibition was held in 2013. For Jenny, who is an expert analogue printer, the main consolation and trade off was likely the huge number of people who "saw" her work and took an interest in her mysterious low tech images. "Glimpsed," however, would be a more accurate description of the interaction from the great majority of onlookers who have not learned the rewards of paying adequate attention to pictures and their meaning. Some smart ones used the light from their cell phones to take a closer look in the shadows. 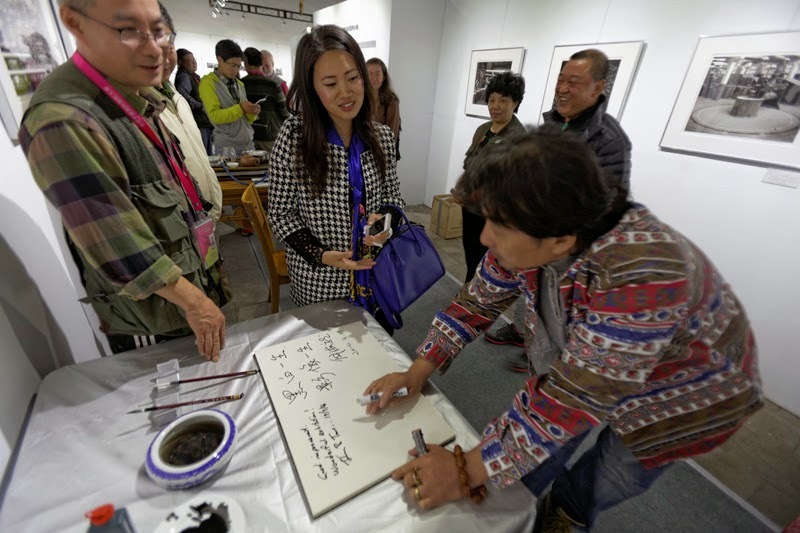 Kashi, billed as a star attraction, and a PIP award winner, didn't visit Pingyao to see where his three essays were displayed, but his work can best be seen in publications and on the web. Jenny's best prints, with their nuances of tone, detail and colour need to be seen in decent lighting. 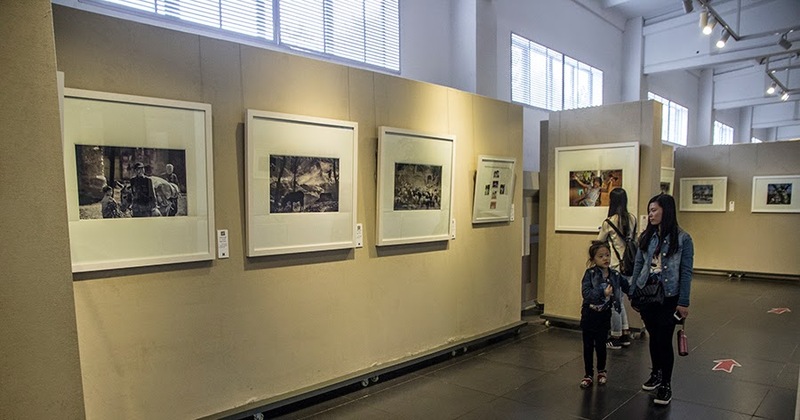 For at least one exhibitor, Cui Ke Jun, in the courtyard of the Ji Xiang Temple, the solution was to display her whole show in expensive looking light boxes and publish a well-illustrated catalogue as well. 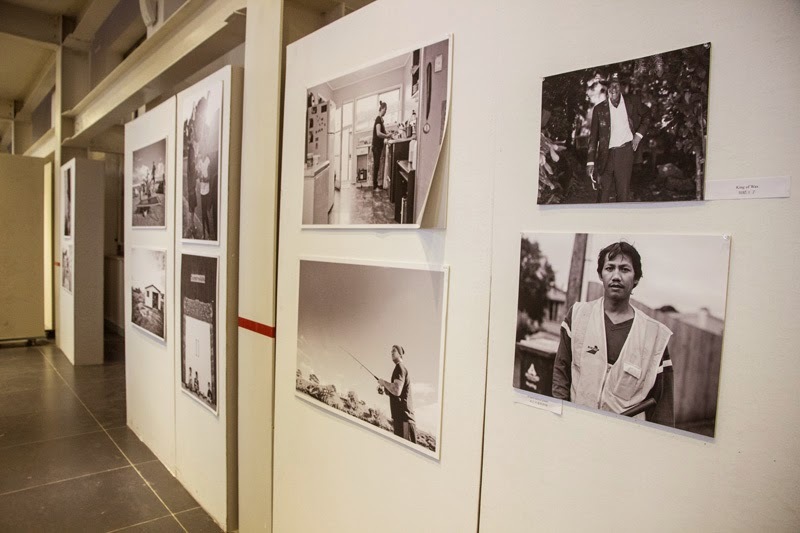 In the same temple, a group of Hebei Province black & white photographers whom I had met last year, had gone to the trouble of creating a professional gallery in the main hall for their exhibition on the decline and rise of industrial sites. 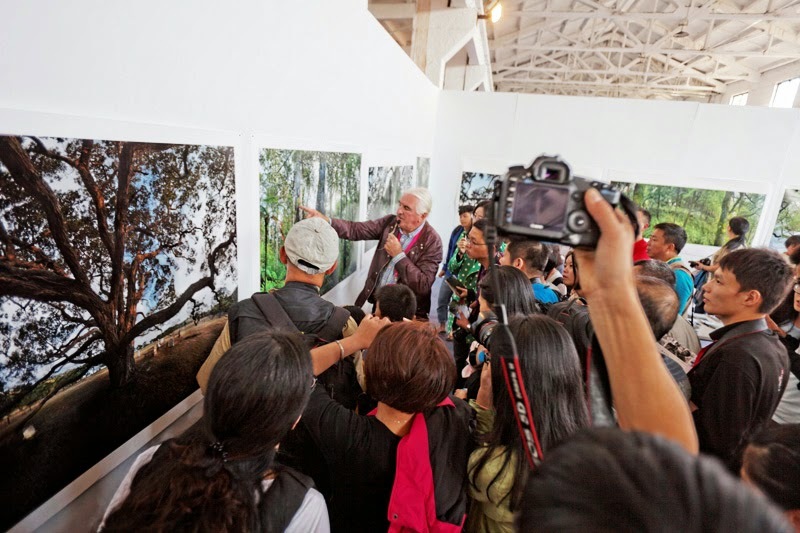 Called 'Industry of Hebei - Memory,' it was curated by Song Jianmin. It is not known if their gallery will stay put for future exhibitions, but it proved to be a handsome venue that did full justice to the care with which they had crafted their prints. 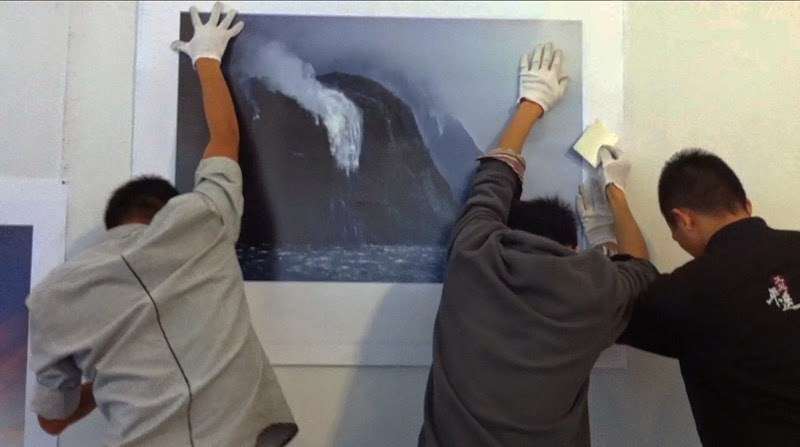 Craig Potton was so taken with one of Song Jianmin's own photographs that he ordered one on the spot. 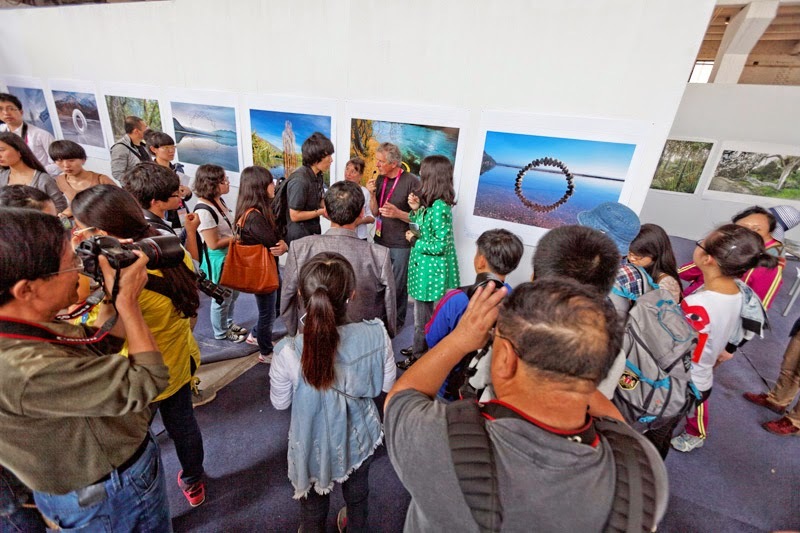 That was on the evening when we, the New Zealand contingent, were generously hosted by the Hebei Black & White Photographers Association, and through them briefly met a number of top Chinese photographers and curators who had three meetings to attend on the night. Our "free" catalogues proved a hit and will last far longer than the show. Designed from my rough by Hamish Macdonald in Auckland, and printed by Artron in Beijing, our 32-page A6 catalogues ended up costing about NZ 40 cents per copy to produce. 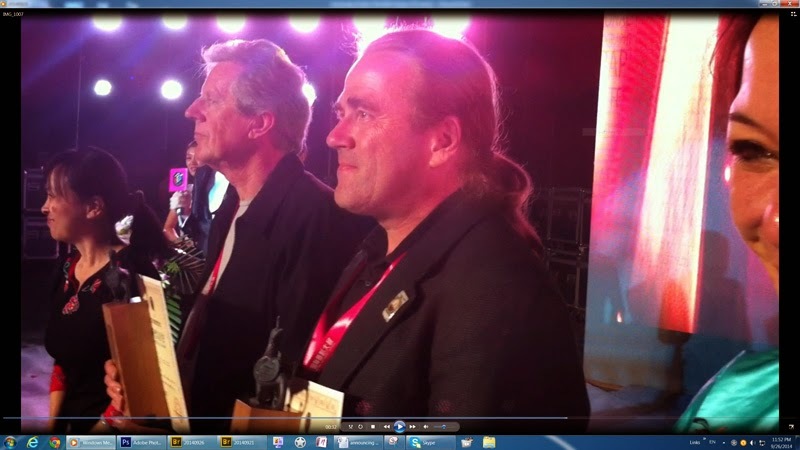 They were paid for from a pooled NZ return air fare paid by PIP for one exhibitor or curator for a featured guest show. People kept the bilingual booklets, where previously some of our handouts were tossed away. When asked to put a retail price on them, one visitor suggested a selling price of 10 yuan ($NZ 2). The thought of introducing the concept of koha to recoup some costs did occur as anybody who more than glimpsed at the work got a free copy. When we weren't there, some visitors helped themselves to copies stored under a table, supposedly out of sight and mind. That was a kind of back hand compliment, I guess, like the early disappearance of our unposted posters, and later the removal of two of Potton's waterfall prints on the last day of the Festival. The problem being that our show was among those intended to leave up for visitors during the October national holiday. 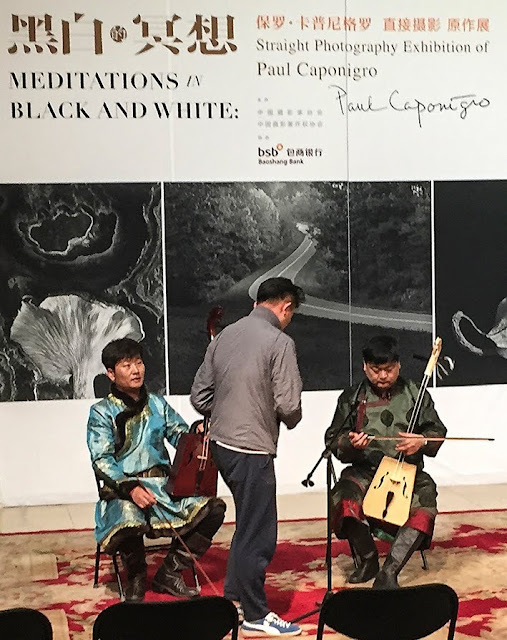 Craig and Martin's prints were among over 1,500 exhibition prints made by Zhang Zong Hao, an amazingly patient and dedicated PIP volunteer, at their Taiyuan headquarters, from files provided. These prints are destined for destruction after the Festival. 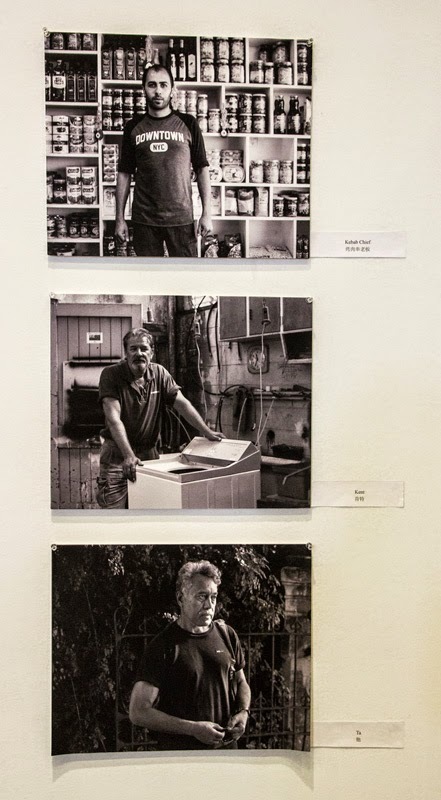 Ian, however, made his own 1.5 to 2 metre wide prints and had a list of admirers willing to adopt an unframed print that showed the signs of being touched by hundreds of visitors. Not being framed or protected under glass, also meant that there was no time to trim the prints for their intended borders, so they were hung as received with the fine trim line evident but relatively unobtrusive. After a couple of days the prints did sag a little but the actual images, with wide borders around them, were hardly affected. PIP's wall labels are fairly primitive, with proportionally distorted artist's portraits, so I got our redesigned versions printed commercially, along with separate captions for each picture. 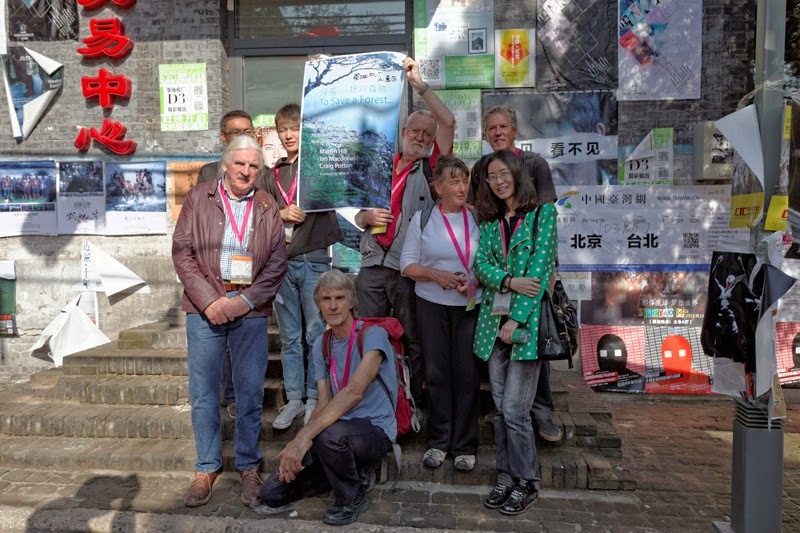 My friend, Prof. Fang Xu, who was visiting from Wuhan with his students - and exhibiting alongside them in the Warehouse, kindly hand wrote the venue of our exhibition on a dozen new posters which the volunteers displayed wherever they could. It is a lot of extra work, and often confusing to deal with, if one doesn't read or write in Mandarin, but there is no doubt that the predominantly Chinese audience appreciate having texts in their own language. Just as it is a blessing to find the locals who identify more than just their phone number or email address in Pinyin. The use value of the PIP compendium, for English readers is severely undermined where translations are not provided. An international marketing opportunity is also lost. 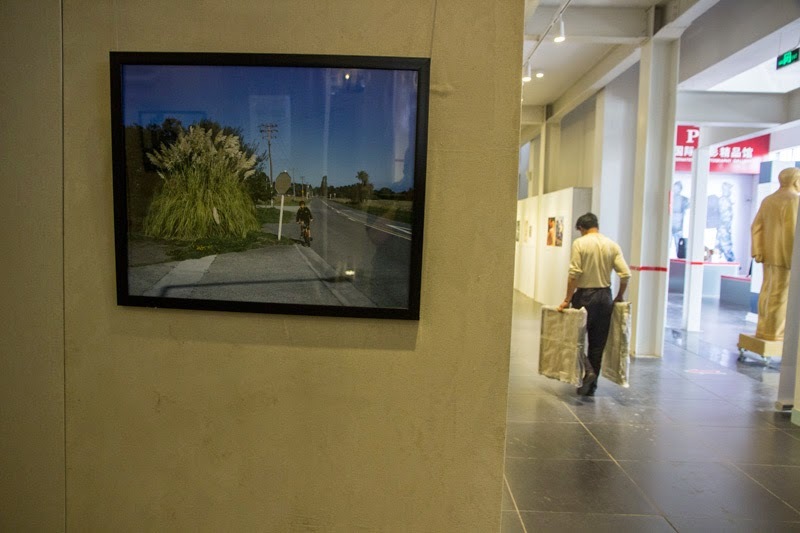 The 2014 China Pingyao International Photography Festival compendium, subtitled 'Life of Photography. World of Dream' is 476 pages, 40 more than their 2013 issue. 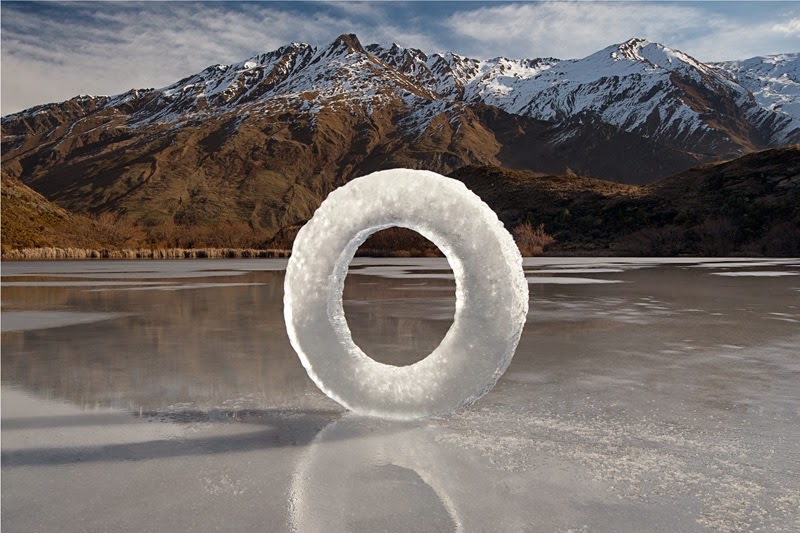 Right from the start Martin Hill's elegant photographs drew attention with the simple universal forms with which they construct temporal sculptures from local materials such as ice, sticks, stones and leaves. Martin was concerned to make clear that his photographs featured symbolic sculpted shapes made by him and his partner, Philippa Jones, and were not found objects. That was something the more sophisticated visitors understood, but the confusion was palpable among a large number who had not yet read the catalogue or captions and figured it out. After we were first informed that none would be available, a large new video monitor miraculously appeared, and was quickly assembled by Ian Macdonald so Martin could run his short film showing how he and Philippa made their sculptures for the camera in the mode art historian Van Deren Coke called 'Fabricated to be Photographed'. By contrast, in an ironic twist, Ian Macdonald's latest work, composed of numerous segments seamlessly stitched together, can be accurately described as 'Photographed to be Fabricated.' Both approaches have become as mainstream as Ansel Adams's (or Craig Potton's) "straight" photography, thanks to the digital revolution. 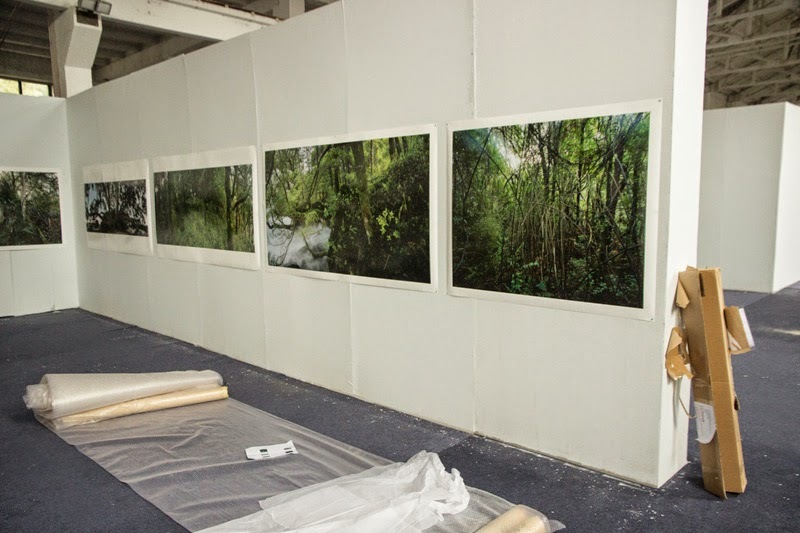 For this exhibition each method has been used for the purpose of raising awareness about the crucial need to protect the natural environment and nature's cycles upon which we depend for survival. 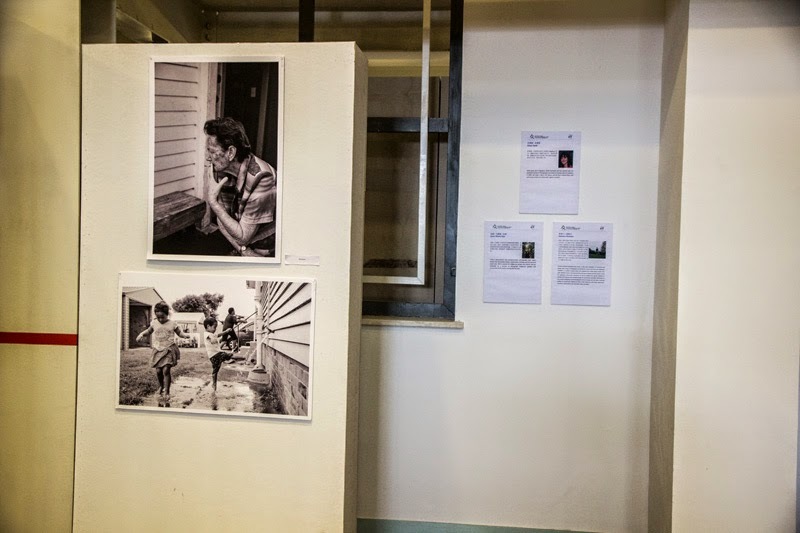 Martin's award, as well as giving due credit, had the effect of drawing more people to our exhibition and more serious attention, which is obviously a plus, and it helped me to publicise the exhibition more widely in print and on the internet. 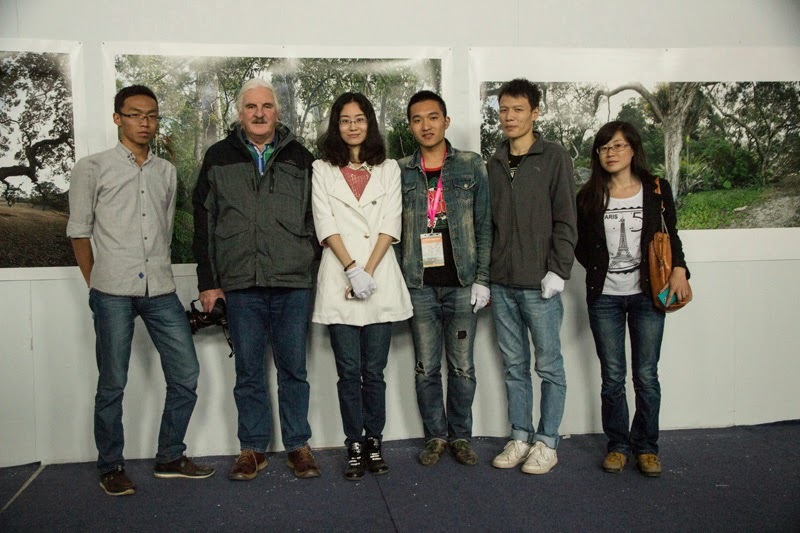 It has also led to interest in exhibiting his work, and by extension, likely Craig's and Ian's as well, in China. 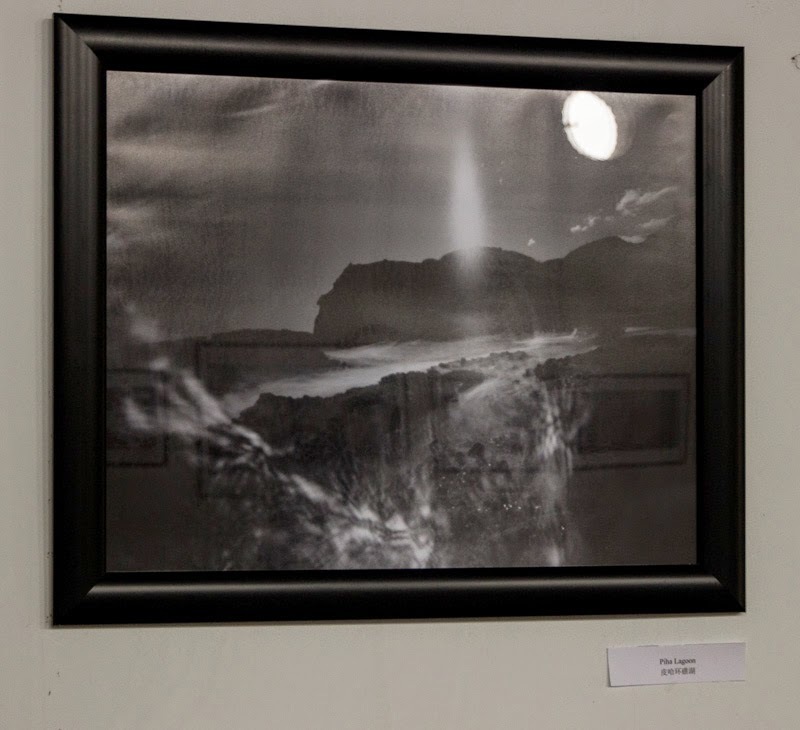 Awards certainly provide exposure and leverage for the winners, so Martin's work was also featured in People's Photography newspaper. 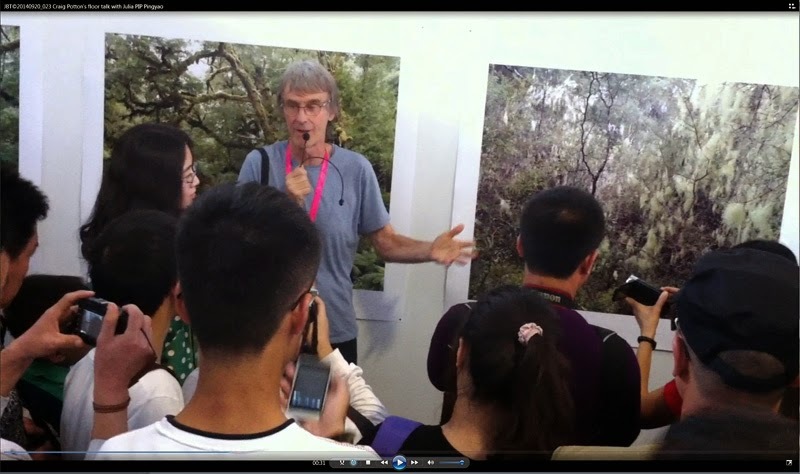 Despite the down sides, it is still worthwhile exhibiting at Pingyao, and the interest in work from New Zealand is growing. 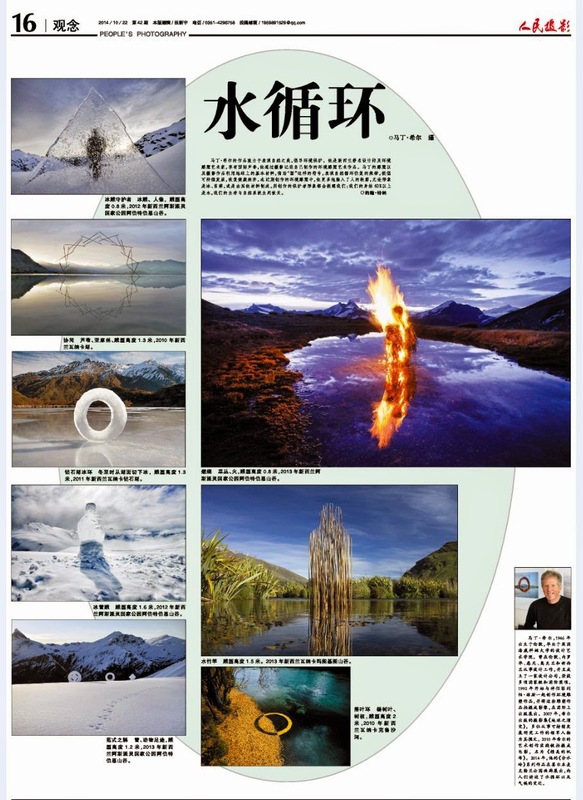 Julia Durkin was a judge at the China International Press Photo Contest (CHIPP) in Beijing in April this year and that led to an invitation for her to provide a series of interviews with New Zealand photographers for China's Photo World magazine in 2015. 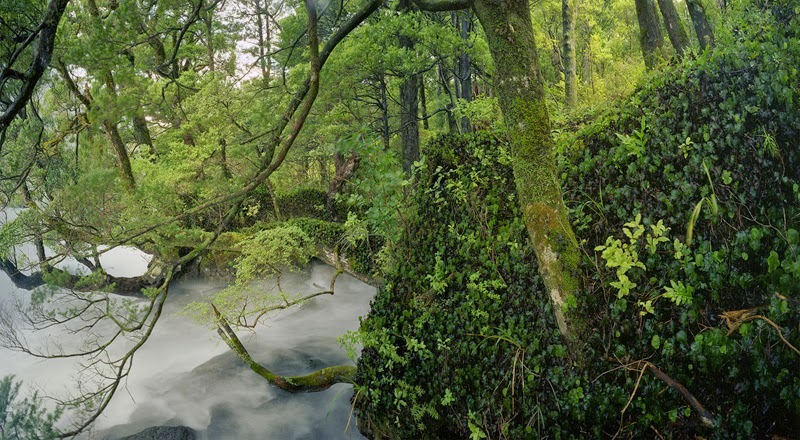 She is raising the profile of New Zealand photography through the Asia Pacific Photoforum, and the Auckland Festival of Photography has already started to feature photographers from China in its offerings. 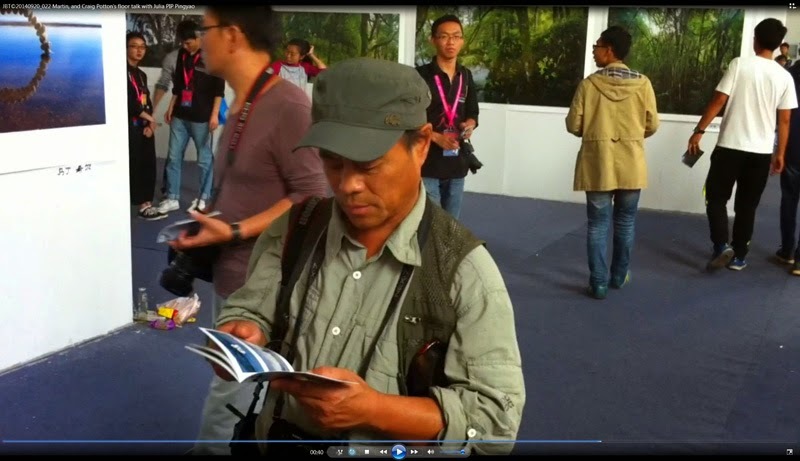 For me, I am starting to represent Martin Hill, Ian Macdonald and Craig Potton in China and working towards getting exhibitions for them and a few Chinese photographers. 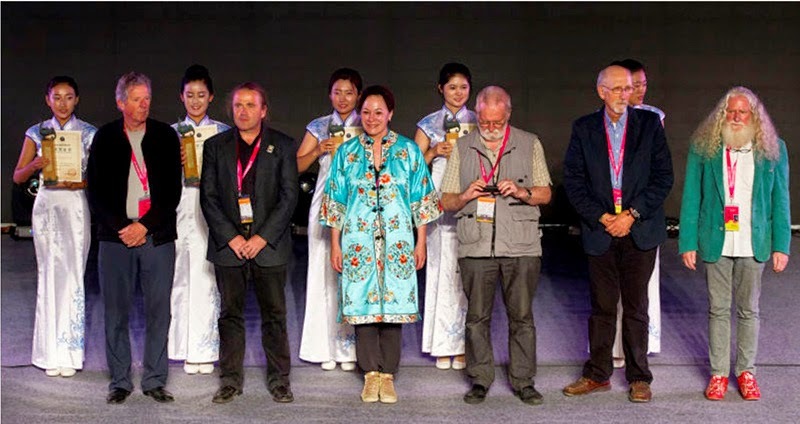 So it was rewarding also to see that Wang Qing, whose essay on a traditional Moslem Uighur community in Turpan, Sinkiang, I helped place with the New York Times earlier this year, won an award for her work at PIP. Unless otherwise noted the photographs were made by me. Apologies for the typographical hiccups.